Several months ago I went on a quest to simplify our lives and household while at the same time making it healthier and spending less money. I was feeling annoyed with American consumerism and all the unnecessary products taking up space in my house and the money spent with cleaners, cosmetics, etc. Obviously you can buy really cheap products, that are often horrible for you, or you can buy "green" products but spend a lot more money. I wasn't liking either of these options so set out to find alternatives. This quest has played out in different ways. Such as: Changing the way I cook and buy food. Using essential oils, replacing store cosmetics with homemade ones, using safe and cheap items we already have on hand to clean with, etc. Regardless, I hope to start sharing some of the ways I've found to make my life simpler, greener, and healthier. First up: getting rid of my shampoo and conditioner. Or, the "no poo" method. I am not the originator of this. I got it from this blog: Becoming Peculiar (actually, she's not the originator either, but I like her blog and found the idea here). Specifically, THIS POST about ditching shampoo is where I started. She goes through why shampoo is an unnecessary product (bad for the environment & bad for your body) and then she explains how to avoid it. If you don't want the back story, here's the short of it: below you will see what I've been using for several months to wash my hair. On the left, is my 'shampoo' a tablespoon of baking soda diluted in a cup of water. I give it a shake, and squirt it on my scalp and down my rather long hair. Massage it in and rinse. It lasts for about four shampoos, which for me is about two weeks because I've found I only need to wash my hair twice a week. On the right, I mix one cup of warm water with two tablespoons of apple cider vinegar into a spray bottle. It functions as my 'conditioner'. I'll admit when I'm washing my hair, it does not feel like I'm getting it clean. The first time I was doing it I was thinking "this totally isn't going to work", but I promise it does! I can honestly say there have been zero negative changes to my hair since switching to this method. If anything, my hair is healthier. Not to mention I'm spending next to nothing. Sometimes I do miss having good smelling shampoo. I'll admit that spraying vinegar on my hair isn't the most enjoyable shower experience. 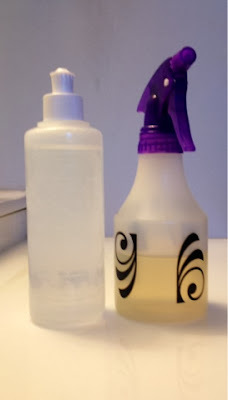 I do keep little sample bottles of a chemical-free shampoo and conditioner in my shower if I forget to remake my baking soda mix or if I'm just feeling like having a good aroma. So interesting! Keep these posts coming! Excited to see what else you're doing! Thanks for your post. Tried both the no poo and rinse today. My hair and scalp feel very fresh. I third the "too pale for makeup" woes! It has been a long time since I've been this pale--haha! inspired to try this. I use She Moisture stuff that doesn't lather up/use soap strippers right now. Something in-between no shampoo and the baking soda method. My hair is used to that and not washing everyday, so I may be to a good place to try even more minimal stuff :) I worried my hair would get really dry from it though...it's already on the dry side normally. Would you say your hair feels more dry now? Ha, Ann loving the type-os. :) I haven't noticed my hair seeming dry. However, once every couple weeks I do an after-shower leave in conditioner. So that probably helps. this post made me want to sit down with you and share ideas. :) come over sometime when you're bored. Ann, in case Em doesn't see this, I'll give you my experience. I've been using this method for several months now. I will say that I wasn't too sure the first two weeks. Your hair may go through an "odd" period for a while, but I will say - for me- that hanging in there has been worth it. I find my hair softer and shinier than it ever was when I used shampoo & conditioner. So, I guess if you are up for it, keep doing this every other day and see if you adjust. Also, I always rinse really well after dumping the baking soda mixture. Then I do a LOT of spraying with the ACV, making sure to get my scalp as well. Of course, I then rinse that all out, and I do think it makes a difference to rinse well and don't skimp with the ACV...:). Hope that helps!